Reserved parking lets you rent a parking space at most stations for use Monday to Friday, excluding holidays. You may park only one vehicle in your reserved parking space at any one time. No new applications are being accepted for King City, Maple, Rutherford, Long Branch, Mimico, and Weston GO Stations at this time as a result of a large waiting list. You can apply online here. We must receive applications no later than the 15th of the month because reserved parking starts on the first day of the next month. All reserved parking depends on whether there are spaces available. At Aurora GO Station reserved parking is located in the parking garage where there is a height restriction of 1.93 m (6ft 4in). A reserved parking space costs $98 per month, including HST. You may rent a space for a minimum of 6 months. After the first 6 months, your reserved parking will automatically renew on a month-to-month basis. You can pay for your reserved space either by pre-authorized debit or pre-authorized credit (Visa, MasterCard, and American Express). To pay by credit card, you must have a valid email address. We reserve the right to charge a $35 fee for any dishonoured payments. Once you have reserved parking, you need to know which guidelines to follow, what to do if someone parks in your space, and how to transfer to another reserved space. You give us your licence plate number so we can make sure you’re registered with the correct reserved parking space. You cannot leave your vehicle in your reserved parking space for a period of more than 48 hours. At Weston GO Station, parking isn’t allowed between 2 a.m. and 5 a.m. daily. You must pay for the full month even if there are weekdays you won’t use the parking space. You may not lend or sublet your reserved parking space. Only vehicles identified on the application are permitted to use your space. Park in the Kiss & Ride area, but please don’t block the flow of traffic. If there isn’t an attendant, call Transit Safety after 9 a.m. at 905-803-0642 and let them know your name, your station, your reserved space number, and your vehicle’s licence plate number. It’s free to call from a GO-station pay phone. Normally, a transit safety officer will be sent to ticket the illegally parked car before 3 p.m. that day. Send us an email to transfer your reserved parking to another station. If another space is available at that station, we’ll transfer you to it, starting the first of the following month. You get one free transfer when using reserved parking. Any future transfers will each cost $35. If there are no spaces available, you’ll be placed on a waiting list, which we check daily. We contact the people on the list in chronological order if a space becomes available. If you don’t want the space that we offer you, we’ll contact the next person. If you cancel your reserved parking within the first 6 months, you’ll be charged $100. You must wait 6 months before you can re-apply for reserved parking. 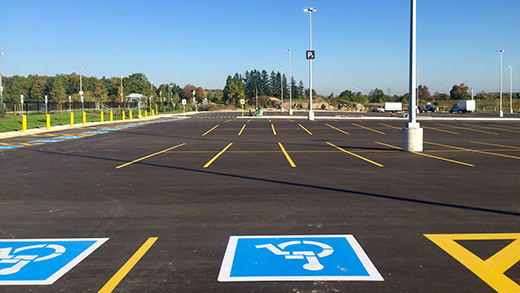 From November 1, 2018 until June 30, 2019, we’re piloting a new approach for reserved parking spaces at Port Credit and Oshawa GO stations. We’re opening up reserved parking spaces that may otherwise sit empty all day for general parking use starting at 11:00 a.m. on weekdays as we noticed that not all reserved parking spaces are used every day. Making these spaces available for general parking after 11:00 a.m. will help us efficiently use resources and balance the needs of all our customers, especially those who use GO after the morning rush hours. During the pilot, reserved parking hours at Port Credit and Oshawa will be from 5:00 a.m. until 11:00 a.m. Monday through Friday; use of the spaces by non-reserved parking customers during this time may lead to the vehicle being ticketed and towed at the vehicle owners’ expense. Port Credit and Oshawa reserved parking customers who arrive after 11:00 a.m. and find their spot is occupied can use another reserved parking space or any general parking space. Click here to read the Reserved Parking Terms & Conditions.